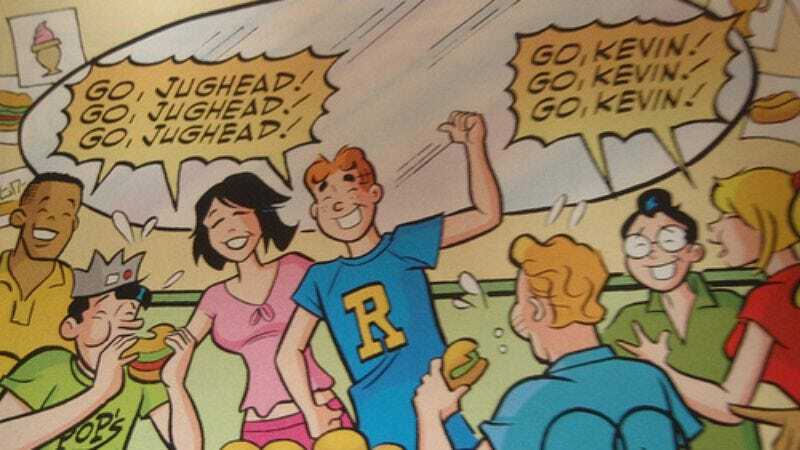 Warner Bros. is developing a big-screen movie based on Archie Comics, the 72-year-old series about a group of perpetual teenagers caught in a time-warped purgatory, the unyielding prison of Midwestern wholesomeness magnifying their every petty romantic problem into a grotesque, life-consuming torment. Thankfully, according to Deadline, there’s a possibility that those horrors will be softened for a broader audience with the ameliorating addition of zombies: Roberto Aguirre-Sacasa (Spider-Man: Turn Off The Dark, Glee) is writing the screenplay, and he’s also helming a new Archie alternate universe line called Afterlife With Archie. And that connection is enough to have Deadline speculating this Archie film will also have a fun zombie apocalypse plot to keep things from getting too grim. While there’s no actual evidence to support that yet—and Warner Bros. is allowing only that Archie will be “a high school comedy based on the original line of Archie Comics set in present-day Riverdale”—Deadline says it finds it “hard to believe that zombies won’t play a role in the new movie somehow.” Indeed, otherwise Archie would be a movie about kids condemned to spend eternity choosing between the only two fickle girls in existence, forever unable to sate their ravenous hunger no matter how many hamburger-eating contests they participate in. Adding some zombies would surely lighten things up.